Custom Imprinted Pocket Corkscrews with your Logo/Message! Our popular Custom Pocket Corkscrews will add professionalism to your bar, restaurant, or hotel. 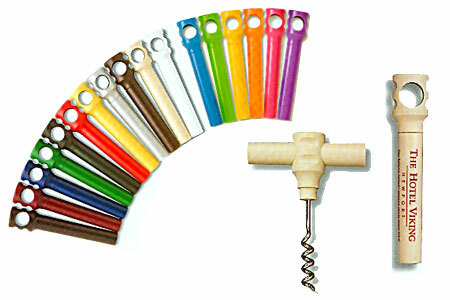 These Plastic Customized Corkscrews also make a great promotional give-aways. Each Corkscrew measures 4-1/4" long by 1/2" wide when closed. A perennial favorite, our Imprinted Corkscrews are compact and durable, featuring a two-piece high-impact plastic design. The protective sheath that covers the metal spiral/screw comes off to form a firm crossbar handle. The following Pocket Corkscrew colors are available: Black, Burgundy, Blue, Medium Green, Dark Green, Red, Woodtone (Yellow), Silver Gray, Chocolate Brown, Bone, White, Turquoise, Lime, Lemon, mango )Orange), Raspberry (Pink), and Grape. Also available in Translucent Red, Clear, Green, Smoke, & Blue. 3000C-FR 4.5" Pocket Corkscrews, Imprinted 0.96 0.92 0.82 0.79 0.75 1" x 2"
3000B-FR 4.5" Pocket Corkscrews, Blank 0.75 0.71 0.69 0.67 0.65 1" x 2"
For additional information on Custom Corkscrews, please contact us at 1-800-233-0828. Feel free to browse our other Entertainment Supplies, including Custom Imprinted Bottle Openers, Custom Plastic Glassware, Custom-Imprinted Glasses, and much more!